Getting close to 16K followers over there. We repost a lot of our customers’ armor pics. It feels like a supportive community, as opposed to FB which feels like an empty field (no one see our posts anymore). Elfin wear, steampunk top hat, mermaid bra, molten rock costume with firey LEDs, winged helmet, WOW armor, anklets, dragon accessories for a horse and rider, Halloween decorations, goblin king armor, belly dance belts, dark moon faery pieces…. 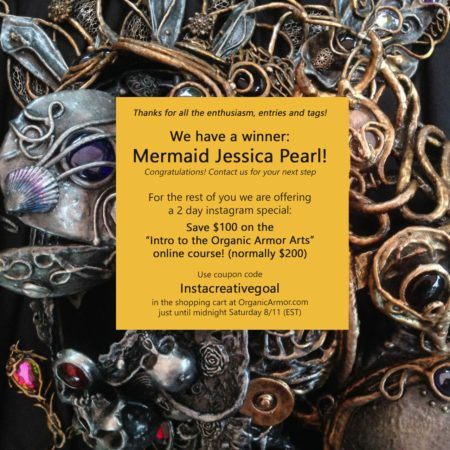 The winner was Mermaid Jessica Pearl! Her first creative goal is to make mer bracers with the techniques. Thanks for playing everyone. We will def do it again in the fall.